Even after my second trip to the region, I do not know much about Pinnacle. It is a small community in southwest Stokes County. It was incorporated in 1901, but it's charter was repealed in 1903. Originally, it was known as Culler, for Emmanuel W. Culler who owned part of the land on which the railroad station was built (around 1888). The present name was adopted in 1894. It is at an altitude of 1,085 feet. This image is from the ICC valuation blueprint. 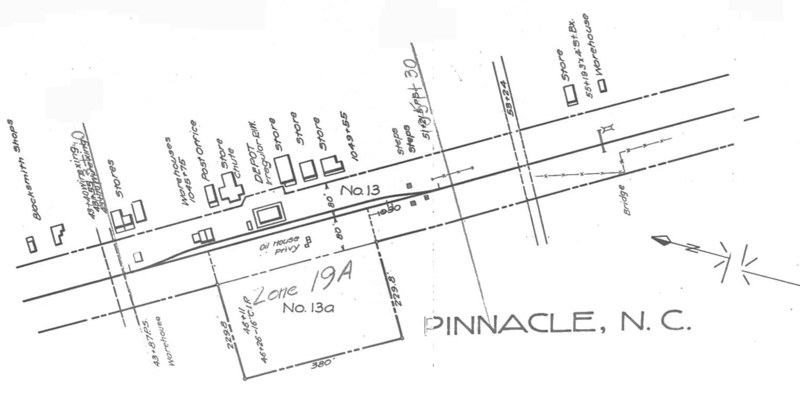 According to an A&Y ETT, Pinnacle had a capacity for 34 cars in the sidings and spurs. 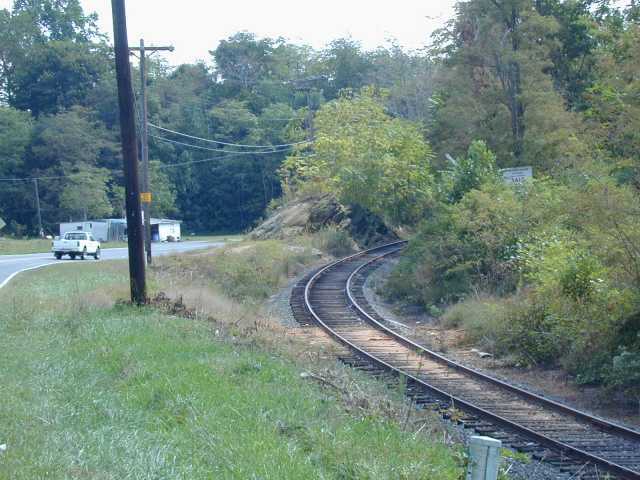 Train 61 stopped every day except Sunday at 11:50 AM or thereabouts as it headed north and west to Mount Airy. Train 60 dropped in about 9:55 AM on the way to Greensboro daily except Sundays. 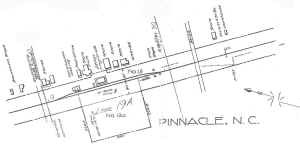 Here's a shot of track is close to Pinnacle, but is actually in King, looking south. I would really appreciate any information on this town from anybody knowledgeable! This website is copyrighted 1998-2016 by David M. Bott. Images appearing on this website may be protected by U.S. Copyright Law, donor restrictions, and other rights or policies. The Railroad Roman font used in the title was bought from Ben Coifman. Persons who contemplate copying and using font or images should obtain all necessary permissions pertaining to use. Authorization to use images credited to the North Carolina Collection, University of N.C. Library at Chapel Hill should be sought from the Collection at CB#3934, Wilson Library, University of North Carolina at Chapel Hill, Chapel Hill, NC 27514-8890. Telephone 919-962-7992. Images credited to the North Carolina State Library Photo Archives are considered in the public domain. Images credited to others or unknown are subject to copyright restrictions and permission for use should be obtained.